What a lovely day yesterday was, we had a pretty chilled day - I did some designing for a little something I'm making and sewing at the moment. I'll be sure to show it when its done and gifted! Stuart and I had brunch - english muffins, eggs and bacon - yummy! Which was followed by a walk around the park and our first ice-cream of the year! The ice-cream van was there and it was just too tempting - so we shared one. I also got my camera to the repair shop, the guy doesn't know exactly what's gone wrong but its something to do with the lens - fingers crossed its not too difficult and costly to fix. I'm currently using my little pocket camera for my card photos and whiles its okay, it just isn't the same as my digital SLR. What did you do with your Saturday? Anyway, here's a nice and simple card today. These beautiful notecards come with a watercoloured effect complete with a watercolor paper texture too (they even have the thickness you'd associate with watercolour paper)! They look great and are so lovely to use. All yo need is a sentiment and a little image or punch and voila you're done! 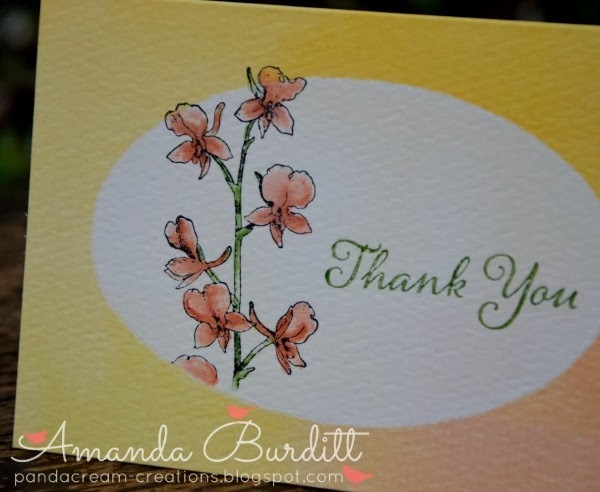 Here I stamped the orchid flower from the Happy Watercolor set and using just a couple of ink pads and a blender pen, coloured in the flowers. Added a sentiment and I'm done. 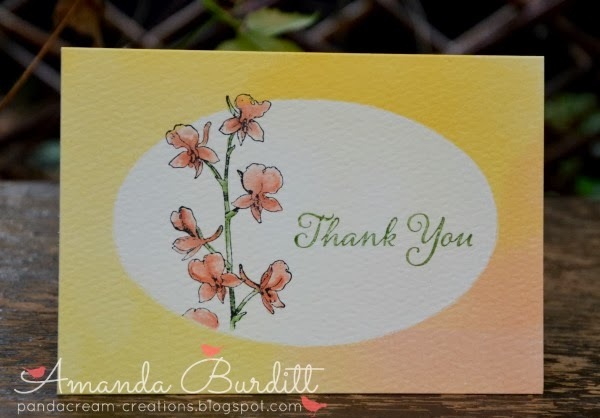 These watercolour notecards are great to have on had for a quick card or an emergency card - stamp and go! Plus this is only one layer so perfect for posting with no additional costs... oh and they come complete with envelopes too!!! These are £11.95 for 20 which works out at 59p each - such a great deal and such a good quality! If you'd like some, you can order them on my online shop or if you're local to me, you can shoot me an email at amanda_burditt@hotmail.co.uk and place your order. I have an order going in sometime next week and would be happy to tag anything on! Ohh, what a gorgeous card. So simple and yet so stunning. Thanks for sharing. Lovely card... just what I needed to get started using that stamp set. Thank you for sharing.